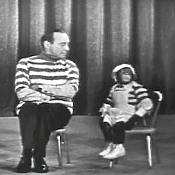 On November 7, 1959 Jack Benny presented an hour long TV special along with guests Danny Thomas and Raymond Burr, The McGuire Sisters, Mel Blanc and one of the most famous and hilarious comedy skits ever presented on and Benny program as Jack appeared with the MARQUIS CHIMPS. A guaranteed laugh riot. On April 10, 1969 David Frost began his first of several special shows from Hollywood. Tonight the entire 90 minutes was devoted to comedian Jack Benny. Here you will hear amusing stories about Jack and his history in show business. He will tell stories about George Burns and many of his friends. And don’t miss the wonderful moment when Benny pulls out his violin to play for the audience. These previous moments will be cherished by any fan of Jack Benny or the early days of TV comedy.